Braeface is a category B-listed traditional stone-built house with accommodation laid out over four levels. The open-plan sitting room and dining room, both with views out to the water and mountains beyond, are on the first floor alongside the kitchen, while the bedroom accommodation is located on the floors above. Accommodation in total comprises: reception hall, pantry, utility room, cellar/store on the ground floor; upstairs are the sitting/dining room and the kitchen; the second floor has four bedrooms and the third floor features an open plan bedroom/sitting room with a stone fireplace. The former byre is attached to the main house, and could provide additional accommodation or holiday accommodation to rent. The gardens include a small and productive vegetable garden behind the house, and the majority of the 38 acres are given over to pasture and trees. The present owners have enjoyed stalking three species of deer: Sika, Red and Roe, while a pond provides duck flighting. The owners have also bred Highland cattle and a small flock of sheep, as well as pedigree pigs. 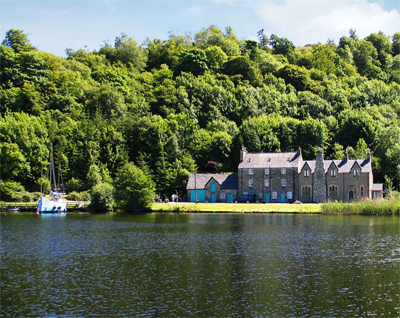 The Argyllshire coastal hamlet of Bellanoch is a very pretty, protected area with the village of Crinan just over a mile away, which is the sea end of the Crinal canal. Lochgilphead is just over four miles away, and has a good range of local shops – further amenities are available at Oban. The guide price is £420,000. For further information please contact Strutt & Parker on 0141 225 3883 or visit www.struttandparker.com.